Purple-breasted Cotinga is a passeriform bird of the Cotingidae family. 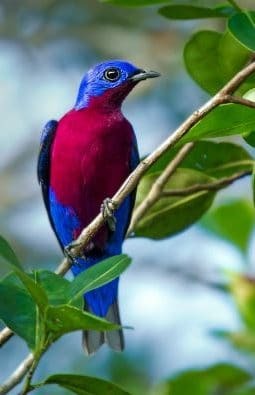 Also known as purple cotinga. 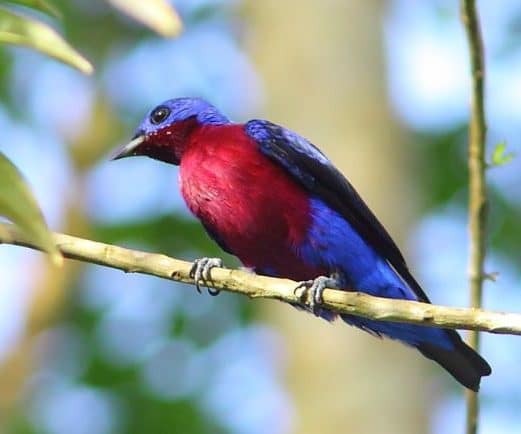 The color of the tops in the male-purple-breasted Cotinga is a deep blue, instead of the turquoise-pale blue of the largest Spangled Cotinga male (Cotinga Yana), which the species is the only widely sympatric congener. The females are typical of the genus and resemble more closely the Cotinga Alopárica congregated (Cotinga to the head), distinguishing itself from the Cotinga Spangled by its aspect more contrasting to the upper parts. Like all their fellows, the Purple-breasted Cotinga is most often perched high, or above the canopy, perhaps drying after the rain, or when visiting a fruit tree. There is much to discover about this beautiful bird, as even its scope has been subjected to important clarifications over the past two decades, especially with the discovery that, at least very locally, penetrates the western Amazon. 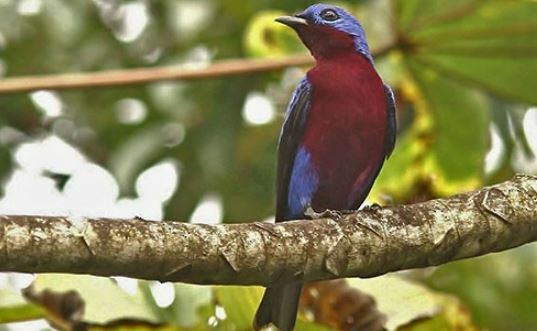 In terms of its life history Also, this species is one of the poorest known of the genus Cotinga, with absolutely nothing known of its creation or many other aspects of the behavior of the species. 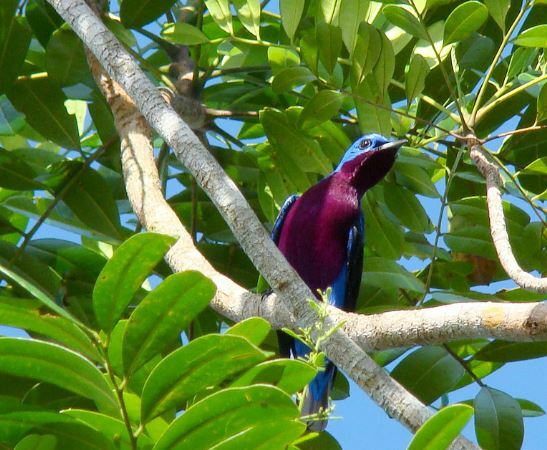 Its scientific name means: do (Tupi) catingá, cotinga = Tupi indigenous name for a colorful and bright bird of the forest. ⇒ Colorful and bright bird. It measures 18 centimeters in length. It has the cobalt blue throat, the chest and the upper half of the belly purple. The female is dark brown. The male emits a fine sound with wings when in flight. Monotypic species (no subspecies recognized ). It is a rare species, inhabiting the canopy and the edges of humid forests, including those in sandy soils.